All PINs are delivered via E-mail instantly. 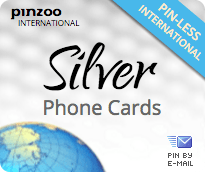 Purchase your PINZOO Silver INSTANT PIN online and have it delivered instantly via email. Your PINZOO Silver INSTANT PINs will also be made available online via your secure account order history page. Rates listed are based on using our local access numbers. An additional half a cent per minute will be added for using our toll-free access number. For more information, click here. Calls billed in 3 minute increments. A U.S. payphone surcharge of 99¢ will apply. A 69¢ service fee applies at midnight after the 1st call and weekly thereafter. Card expires 90 days after 1st use and can be re-activated for another 90 days if more minutes are added. To add minutes to your card, select the recharge option once you login to your account. Calls placed to wireless phones may be charged at higher rates. All rates and fees are subject to change. For the latest domestic and international rates, specific terms and conditions, please call us toll-free 1-888-697-4696. Service provided by Super Prepaid, Inc.